James Gibson knows how to try a lawsuit. A dogged trial lawyer, James has a diverse practice and significant courtroom experience. He develops complex cases, takes them to the courthouse, and works in a cost-efficient and results-oriented manner. When a defense verdict isn’t the ultimate goal, he also knows how to quickly develop pressure points in a case that can limit its value and lead to a quick and cost-effective settlement. In either scenario, James takes great pride in learning the nuances of a client’s business and using that knowledge as a strategic benefit throughout the litigation process. 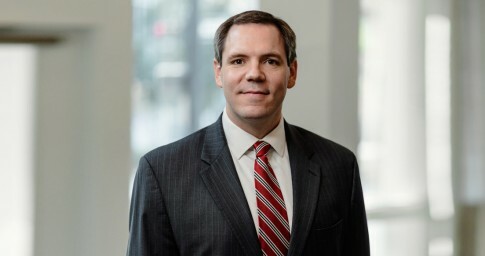 James’ practice focuses on product liability, medical malpractice and consumer fraud defense, but he deftly handles cases across the litigation spectrum. Over the years, he has tried cases involving profound personal injuries, tragic wrongful deaths and alleged consumer fraud leading to millions of dollars in claimed damages. He thrives on the demands and pressures of high-stakes litigation and works tirelessly to promote the desired result in the most stressful of environments. Away from the courtroom, James is the proud husband to another Birmingham lawyer and father to two young sons, Andrew and Thomas. He serves on the Board of Directors at the Horizons School, a residential school providing social and career independence to young adults with learning disabilities. He is also an avid sports fan and active musician. James is a member of Red Mountain Church, where he can often be found playing a Gibson (no relation) guitar on Sundays. Obtaining a defense verdict on behalf of an Alabama obstetrician/gynecologist after a ten-day trial in which plaintiff’s counsel asked the jury for $17 million in damages. Negotiating a favorable settlement of a multiplaintiff catastrophic injury/wrongful death product liability case pending in Cook County, Illinois, on behalf of a home appliance manufacturer. Resolving an extensive dispute between a Lightfoot client and an Alabama professional board related to the alleged unauthorized practice of professional services, with no sanctions or disciplinary action taken against the client. Obtaining complete dismissal of all claims against a consumer services provider following a five-day arbitration in which claimants sought millions of dollars in damages.